we had an outstanding experience from start to finish. we love our new deck. Design suggestions and finished product is what impressed us most with Outback Deck. Their skills and craftsmanship were excellent, especially with FD and the construction crew. The Architect provided excellent options, designs. Crews and construction coordinator were friendly, professional and skilled craftsmen. Great experience – beautiful pergola and deck. We picked the right company to replace our aging deck (28+ years old), and then Outback Deck picked the best crew to complete our project. Our project included a maintenance free composite deck, Fortress railing and a gate, new siding, a new transom double-pane window (which replaced an upstairs French door) and 3 new concrete pads. An out-door faucet and natural gas nozzle were also installed on our deck. Our deck is situated 15' above our sloping wooded backyard. Owners' Bryan Miller, John Gwaltney, and the following team members' Bill Partridge, Theda Quinn and Chris Moore all met and then exceeded our expectations! Bill Partridge and Bill Drury were very thorough in their initial presentations, and offered critical recommendations during the planning stages of our project. I cannot offer enough praise for Elezeo and his deck crew, the plumber, and the siding/painting crews. The entire crew that completed our project were all very professional, on time and very thorough in every aspect of our project. You will not come across a better company that is more committed to a "job well done" than Outback Deck! We are looking forward to some interior renovations in the future. 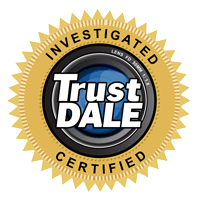 Better Business A+ Rating, and Trust Dale approved. We received answers to questions that we didn't even know we had. The presentation of the plan exceeded expectations in the best way and the follow-through was excellent. Very Professional. They did what they said they would do on the timeline they committed to. Made great recommendations, followed through, worked hard to complete on time. We love our pergola and deck in the backyard. High-quality materials and craftsmanship. The depth of information given at the sales presentation, the quality of the products and the competitive pricing were amazing!